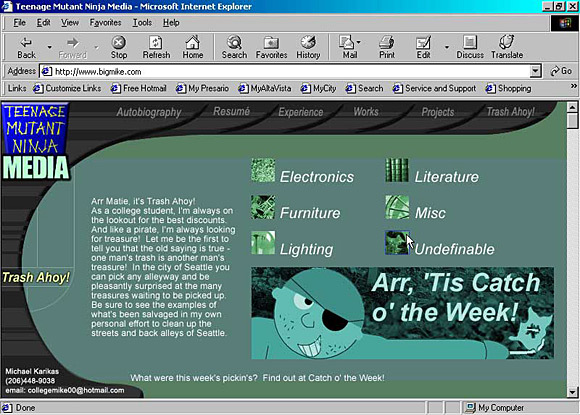 'Trash Ahoy' - June 2001. See, I always liked pirates and dumpster diving. 'Berlin Wall' - September 2001. For a World Civilizations assignment. 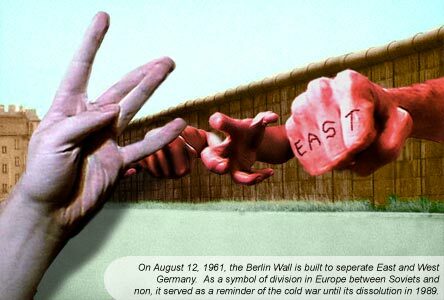 The Berlin Wall was no joke, but I think this is pretty funny. 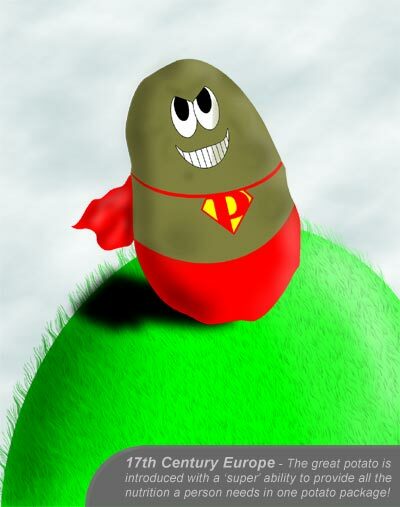 'Super Potato' - September 2001. Also for World Civ. Only in art school can you ace a project by making a super potato. It's really weird to think I made those five years ago. On a side note, I entered my Meow Meow Mix video into this year's AIS Alumni Show, it'd be fun to have it playing 24/7 at the school for a couple months. I have a great Barbra Streisand video to post up here that will knock your socks off... soon. The skin where my arm is busted is a Technicolor wonderland - I never realized that bruises could last for months on end. I've gotta get to bed. You need to update your site, yo. So much is happening in the blogosphere! COmment on it! Make weird pictures about it! Do something! Would you like to illustrate a few children's books containing a personified frog? There is some money involved in the process, too.